What is your allegiance? 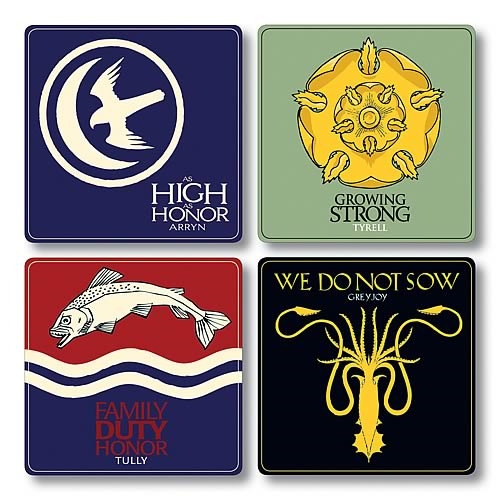 Whether you align yourself with House Arryn, Tyrell, Greyjoy, or Tully, you'll want to place your tabletops under the protective care of these striking Game of Thrones Season 2 Coasters. No matter your allegiance, you're going to love the sigils featured on all 4 of the 4-inch tall x 4-inch wide coasters included in this terrific set, from the leaping silver trout of House Tully to the golden kraken of House Greyjoy. Though the families at war in HBO's Game of Thrones TV series might not have the benefit of accessories like these, you can bet they'd use the Game of Thrones Season 2 Coaster Set if they could! Game of Thrones Rhaegal GITD 4 1/2-Inch Figure - 2018 Excl.